Mammalian hair has long played a role in human society; as fur for clothing, in the production of cloth, or in the production of brushes. Scientists too make use of mammalian hair as a diagnostic tool in areas such as animal ecology, wildlife biology, and nature management. The identification of hairs found in the field, in the intestine or faeces of carnivores, or in the pellets of owls and raptors, can yield valuable information on the distribution of mammals and the diet of their predators. This photographic atlas aids correct identification by providing data on the colour, form and length of hair and the structure of the cuticula, medulla and cross-sections. Identification is also aided by the provision of keys. 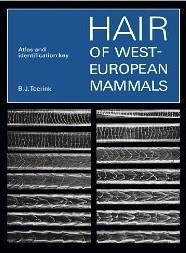 This unique book will provide a valuable reference source for ecologists, zoologists and forensic scientists.